5 ASIAN PEARS THINLY SLICED; 1 LEMON (1/2 juiced & 1/2 sliced for water); filtered water and a dash of cinnamon. This is a drink that is popular in Mexico and Central America that purees fresh fruit with water. Enjoy this peachy delight that is refreshing on the palette. Puree peaches in a blender or food processor. Add all ingredients and blend light save basil to float in the water. Cover and refrigerate until well chilled. If using club soda wait until right before serving to add. Otherwise, filtered water will blend and hold. 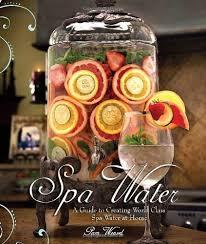 Spa water reminds you of a relaxing day. Sip and enjoy.